Ben Wallace wishes he were a Bobcat . . .
A table full of great raffle prizes, including two tickets to the Browns-Titans game, a golf package, a Marching 110 hat medallion, and assorted OU t-shirts and accessories . . .
A few members of the OU Parents Club decided to join in on the fun . . . Rob Dintaman, left, from the Marching 110 Society of Alumni and Friends, created the event, which included entertainment from Dave Ritz. Thanks for Supporting the 110! Thanks to the more than fifty alumni & friends who braved the downpour on Friday and came to the Barley House! About $400 was raised for the band's trip to the Rose Bowl Parade. That's kind of a drop in the bucket — a complete breakdown of expenses is posted here — but it's about $400 more than they had before, and every little bit helps! Head downtown on Friday for Shuffle for the Roses, a party to support the Marching 110's trip to the 2010 Tournament of Roses parade. For just $20, you'll enjoy unlimited domestic draft beer, well drinks, house wine, and an appetizer buffet. 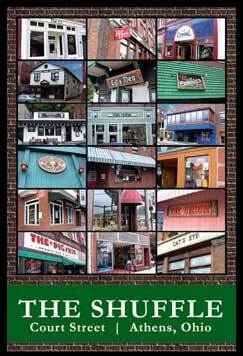 Some of your Athens favorites will also be available, like the classic Brainstomper, Junction Punch, and Black Widow. Cash prizes, raffles, and other giveways will occur throughout the night. Sign up on Facebook, or e-mail Rob Dintaman with the Marching 110 Society of Alumni and Friends. 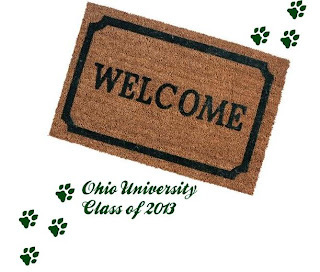 New students and their parents are invited to join the OU Parents Club for an informal reception with Ryan Lombardi, the dean of students, on Wednesday, August 19, at the Garfield Heights Civic Center. It's a great chance to meet other first-year Bobcats, talk to some current students about life on campus, and get answers to last-minute questions. RSVP to Carol Godec (216-328-7657 or cgodec1 at roadrunner dot com) by Sunday, August 16. 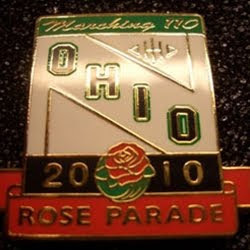 Support the Marching 110's trip to the Rose Bowl Parade in classic OU style!